Information and interactive stands at the Junior and Senior ends to celebrate awareness of respect and equality! Write out an act of kindness and what you have done for someone! Leaflets on LGBT, Mental Health Awareness and disability! ANTI BULLYING WRISTBANDS FOR SALE! Promoting anti bullying in the library – Prize for the winner plus free lollipops for all entrants! 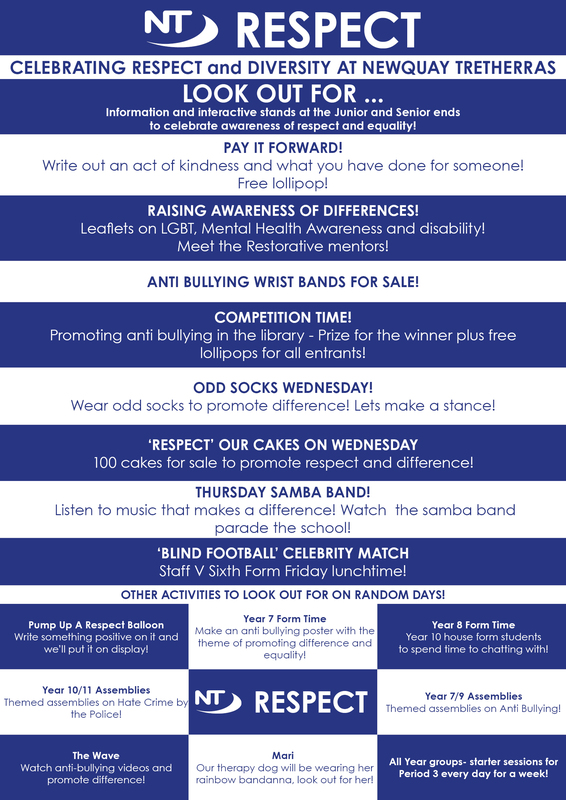 Wear odd socks to promote difference! Lets make a stance! 100 cakes for sale to promote respect and difference! Listen to music that makes a difference! Watch the samba band parade the school! Staff V Sixth Form Friday lunchtime!